A lack of access and poor communication are often cited as reasons why academic research is not widely used by policymakers. But what about the challenges for researchers engaging with decision-makers such as parliaments? Lindsay Walker, Lindsey Pike, Marsha Wood and Hannah Durrant have surveyed more than 400 research professionals and identified some clear barriers, with heavy workloads and a lack of transparency around how research will be used among the most prominent. In order to promote better engagement between academia and policy such initiatives should provide guidance for academics on the different opportunities to submit research evidence, be transparent about why and how that evidence will be used, and provide clear acknowledgement of the research contribution by academic sources. Access to reliable and timely evidence is essential for parliaments to effectively execute their four main functions: scrutiny, legislation, debating, and financial oversight. Sources of evidence can be diverse, with academic research only one type of information used in parliamentary processes. But what about the challenges for researchers engaging with decision-makers such as parliaments? Engaging with a select committee is one of the key mechanisms for researchers to present evidence to Parliament. However, the higher education sector (e.g. universities, research groups) is usually underrepresented in written and oral submissions. One 2013-14 study revealed that just 8.1% of oral evidence presented to select committees was from the higher education sector. Employing such strategies can militate against the current view held by parliamentary staff that academic research is “too abstract from the real world” and “unaware of how Parliament works and what it requires”. So, it is clear there are challenges around academic engagement with Parliament. What is less clear is why. What are the barriers to engaging with parliamentary processes? 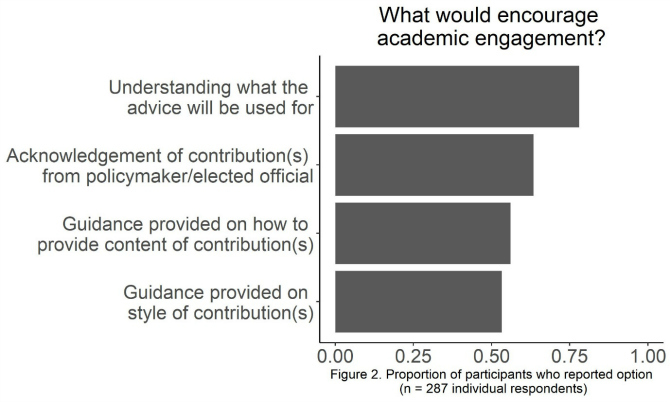 What would motivate academics to engage more with Parliament? Recently, we launched a nationwide survey to improve our understanding of the policy experience of UK-based researchers. This was part of a project to determine the utility and feasibility of establishing the UK Evidence Information Service (EIS), an innovative model that aims to facilitate research engagement with decision-makers. The EIS would act as a rapid matchmaker to connect research-users (including the parliamentary arenas that use evidence) with the UK academic community in the service of evidence-informed public policy. The EIS project was initially funded by the GW4 Building Communities programme and is now supported by a European Research Council grant. Partners in the GW4-funded phase included Cardiff University, University of Exeter, PolicyBristol, University of Bath Institute for Policy Research (IPR), UCL, and the House of Commons Library. Over 400 research professionals participated in our survey. 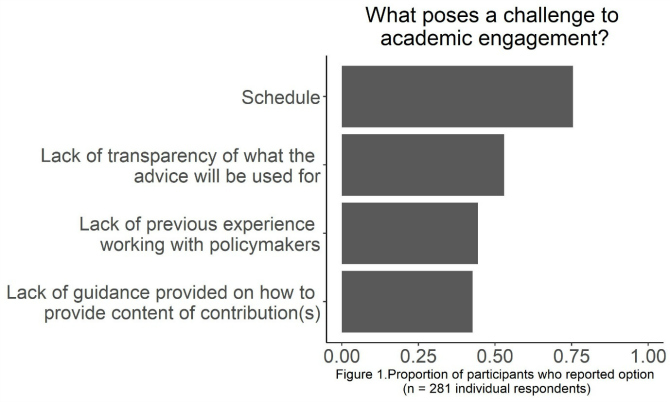 Findings provide clear guidance on how to improve wider policy engagement with academics. For those researchers who have previously engaged with the policy sphere, interest in policy was a common motivator to provide evidence for policymaking. Despite this motivation, considerable barriers to engaging with processes relating to policymaking were identified; workload of the individual researcher being the most prominent reported barrier. Other barriers identified were lack of transparency about what the research findings would be used for; lack of previous experience working with policymakers; and lack of guidance on content of contributions (see Figure 1). Corresponding with this, academics also identified the following key aspects to encouraging engagement with processes relating to policymaking: understanding what the evidence will be used for; receiving guidance on style and content of contribution; and acknowledgement of the academic contribution by the policymaker or elected official (see Figure 2). Women were significantly more likely than men to select options relating to guidance. The workload of academics still poses a challenge to policy-academic engagement. The recent financial incentive for universities to collect evidence of research impact for submission to the Research Excellent Framework (REF) may facilitate discussions around ensuring researchers have protected time for engagement with decision-makers. For REF2014, 20% of impact case studies outlined engagement with the UK Parliament; if universities want to increase this type of engagement, the major barrier of academic workload must be addressed. For example, funding bodies and universities may consider providing dedicated funds for researchers to provide academic-policy contributions, which are currently lacking. Policy-academic engagement is a two-way process with benefits to both sides. By taking into account our findings regarding challenges and benefits for academics to engage, the EIS could enhance the integration of research evidence with policy and practice across the UK. The EIS team have worked with the House of Commons Library and the National Assembly for Wales Research Service over the last year to trial aspects of the proposed system, and the feedback from this will be assessed in the coming months. Do you have ideas to improve academic-policy engagement, or thoughts on the EIS? We welcome your feedback – please leave a comment below or contact Dr Lindsay Walker at walkerl7@cardiff.ac.uk. Featured image credit: Big Ben, sunset, London and Westminster by Ming Jun Tan, via Unsplash (licensed under a CC0 1.0 license). Lindsay Walker is a Research Associate at Cardiff University and an Associate Researcher at the University of Exeter. Lindsay’s key interest is to promote evidence-informed decision-making by facilitating connections between research-providers and research-users. More information about Lindsay’s work can be found on her webpage. Lindsey Pike is the Coordinator for Social Sciences & Law and Arts at PolicyBristol, University of Bristol. Lindsey is interested in facilitating links between research, policy, and practice and tweets at @lindsey_pike. Marsha Wood is a researcher at the Institute for Policy Research (IPR) at the University of Bath. Marsha works on a variety of research projects and project development of relevance to policy debate and decision-making. More information Marsha’s work can be found here. Hannah Durrant is the research lead at the Institute for Policy Research (IPR) at the University of Bath. Hannah delivers the IPR’s research strategy with a focus on establishing and building relationships between IPR’s research and the policy world. More information about Hannah’s work can be found here.